These natural and colored wooden craft pins can be used and decorated in a variety of craft projects. 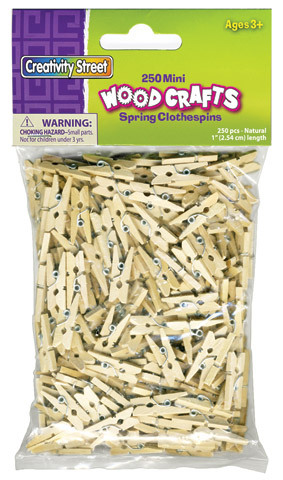 The 1" spring loaded mini-pins are available in natural or colored wood and come in packs of 250 pins. The full-size natural wood spring pins are available in 1.75" and 2.75" lengths and come in packs of 24 pins each. The doll pins are natural wood, 3.75" long and come in packs of 30 pins.